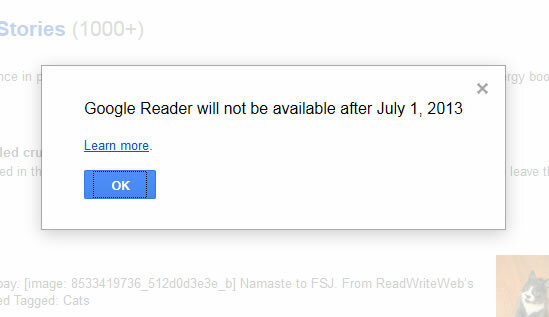 If you visited your Google Reader today you were confronted with a shocking message: “Google Reader will not be available after July 1, 2013”. After Google dropped this surprise to their Google Reader user’s the internet is scrambling with confusion. After all, there are many dedicated Google Reader’s who use it to view RSS feeds. Several petitions have been formed to protest the shutdown of the RSS service, including one at KeepGoogleReader.com, which petitions for Google to make the platform open source in order to keep it alive, and so far, over 21,000 people have signed it. On Change.org, there are several petitions that rally to keep Google Reader alive. Have no fear, there are some alternatives to Google Reader that we’ll list in another post.